Sean Dorsey (Artistic Director, Fresh Meat Productions) and Robin Anderson (Executive Director, AXIS Dance Company) have co-organized and will co-host a national conversation breakout session at the 2018 National Performance Network Conference. This JOINING FORCES session will feature Alice Sheppard (Artistic Director, Disability Dance Works), Janera Solomon (Executive Director, Kelly Strayhorn Theater), Mark Travis Rivera (Artistic Director, marked dance project), Sean Dorsey (Artistic Director, Fresh Meat Productions & Sean Dorsey Dance) and Robin Anderson (Executive Director, AXIS Dance Company). Let’s JOIN FORCES! 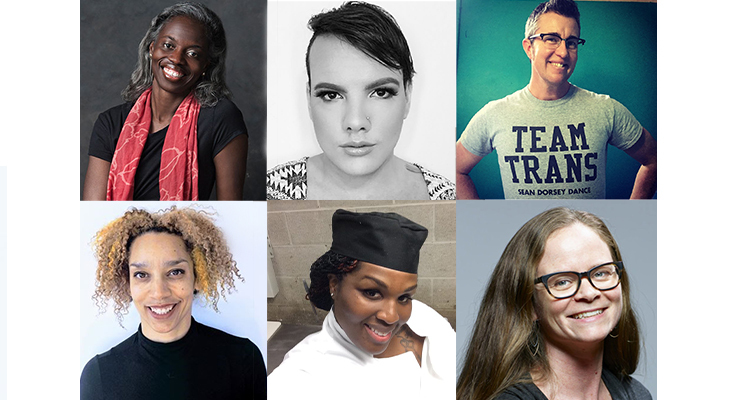 Presenters, artists, programmers, cultural leaders, activists, funders, audiences and lovers: join us for a conversation about building solidarity as we fight for racial justice, disability justice and trans justice in the performing arts. What does creating “access” really mean? How do we move beyond a “diversity” framework with its accompanying check-boxes and tokenism? How do we invest in truly empowered leadership? How do we get white people to stop opting out of conversations about racial justice and white supremacy / get able-bodied people to stop opting out of conversations about disability justice / get cisgender people to stop opting out of conversations about trans justice? Solidarity and joining forces is part of the answer. Let’s talk about it! Cookies will be provided.